As the flying spaghetti monster, you must convert as many people into pastafarians as you can before time runs out! Use your mouse to guide the spaghetti monster across the playfield. 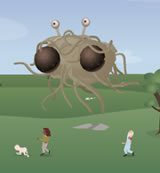 Click the mouse button to deploy your noodly appendage toward the scurrying people! Be sure not to make contact with the darkly-clad school administrators!